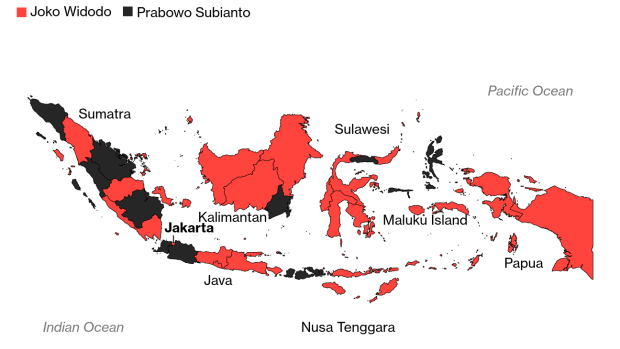 How Will Indonesia Pull Off the World's Largest Single-Day Election? More than 191 million Indonesians are eligible to cast their ballots on Wednesday to elect a new president and several thousand lawmakers to the national and local legislatures. The archipelago of more than 17,000 islands -- that would stretch from New York to Alaska -- will have 810,329 polling stations, data from the General Elections Commission show. In a rematch of 2014 elections, President Joko Widodo is pitted against former general Prabowo Subianto. Both have sought to keep the focus of the seven-month long campaign on bread and butter issues like the price of staples, jobs and the economy, though religious identity politics was a constant election theme in the world’s largest Muslim-majority nation. The simultaneous legislative elections mean there are more than 245,000 candidates in fray for about 20,000 seats for provincial and municipal bodies. That makes it the world’s largest single-day election, according to the International Foundation for Electoral Systems. Voting will begin at 7 a.m. in the world’s third-largest democracy behind India and the U.S. with West Indonesia, including Jakarta, closing the poll two hours after it ends in Papua. Unofficial quick count results are expected to trickle in about two hours after voting closes in the west, while official results will take several weeks. While the country has been organizing single-day presidential voting since the first democratic election in 1999, holding legislative elections concurrently might pose challenges, according to Alexander Arifianto, research fellow with the Indonesia Program at the S. Rajaratnam School of International Studies in Singapore. The simultaneous elections could "create unexpected complications that might test the system,” Arifianto said. “That’s going to create a big headache for KPU,” he said referring to the election commission. With Prabowo, as Subianto is commonly known, alleging widespread irregularities in the voter list and promising a legal challenge in the event of another defeat, a lengthy court battle may ensue once the official results are declared. Prabowo, who lost to Jokowi by about 6 percentage points in the last election in 2014 initially refused to concede and moved the constitutional court, which threw out the case. The elections to the lower house of parliament is seen as the most important among the legislative polls with 16 political parties in fray. Political parties failing to secure 4 percent of the national votes will miss out on having any members in the house, which wields considerable sway over government policies, according to revised rules.